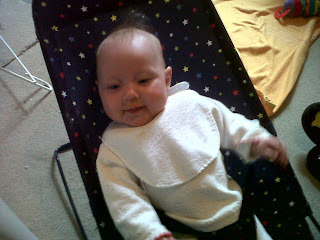 As an update to the weaning, it is all going well, Naomi is still loving food! She has now had her first food that she has to eat for the EAT study and has been eating yoghurt this week, slightly unfortunately, as this is a food she "has" to eat, it probably would be her least favourite so far, though we found that by putting some banana in it (as opposed to apple or pear) she liked it a little better. Her favourite by far, though, continues to be broccoli. I found myself telling her that if she ate her youghurt like a good girl she could have some broccoli as a treat, Sandy pointed out that there is probably only a short window in her life that this will be true! The photo below is after tonight's dinner of broccoli and butternut squash, in contrast to our usual photos of mess, you will notice that barely a drop has been allowed to escape her mouth, broccoli is just too precious to let it sit on a bib you see! its hilarious how much she likes broccoli!